When first installing FreeSentral one can use the Wizard to get the system up and running in just a few simple steps. The Wizard can be used later on also, since any of the steps can be skipped. 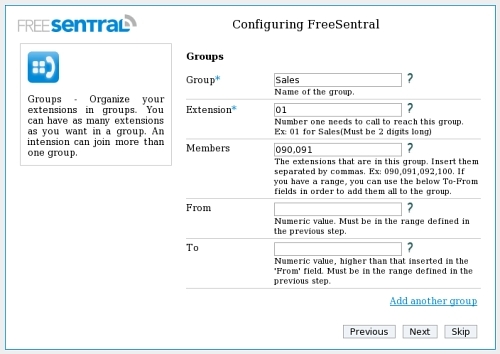 The first step you need to do when setting FreeSentral is to change the password for the default admin. Username is "admin" and password is "admin"
Then you need to generate the extensions that you will want to have in the system. By using the wizard you can insert a range to genetate all the extensions in between those two numbers. If you wish to define them one by one or to upload them you can use "Extension" tab. You can group extensions in groups. You can define one or more groups. To specify the extensions for each group you can either separate them by columns or insert them as range. This extensions should have already been defined in the previous step. Define the gateway that will connect FreeSentral to the outside. 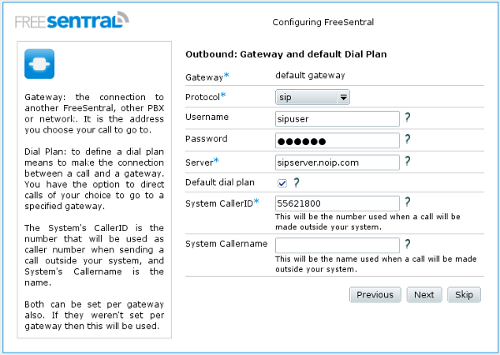 If you check the checkbox to "Default dial plan" then a dial plan that will route all numbers to this gateway will automatically be defined. Then you need to set the number associated to the voicemail service in your network. The next step to take is to configure the Auto Attendant. You have to set the number that will be routed to the Auto Attendant (this will be your company's number) and the default extension or extension associated to a group that will handle the calls for people that didn't press any digits. Then you will need to upload the two prompts: one for the moment when the Auto Attendant is online and one when it's offline(outside the work hours of your company). Then you see the hours and days of the week when it's online. The last step is to set the keys that will match the prompts you've uploaded. 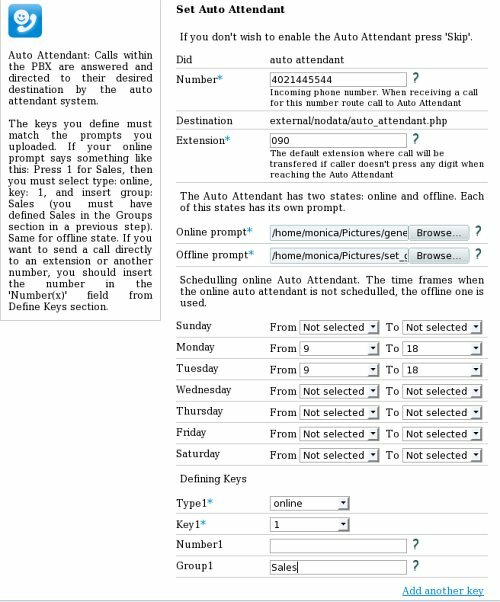 For example if you prompt for the online mode of the Auto Attendant says something like "for Sales please press 1", you will need to define a key as that from the image below. The wizard finishes the setup with the following message: "The wizard has finished configuring your system".